During 2012, three or four storms occurred producing higher than normal tidal events that floated massive quantities of dead plant debris, mostly Salt Cord Grass (Spartina ), out of the Marshes on the Georgia Coast. These extensive masses of marsh plant debris floated out of the marshes, were carried through tidal creeks and rivers through the sounds into the Atlantic Ocean; and then washed ashore with on-shore winds. The Spartina detritus accumulated as massive accumulations along the shores of the barrier islands in aggregates called wrack mats. This year 10 of Georgia’s finest birders arrived on SCI Friday April 27th to join in the 6th annual Spring migration count. Fully equipped with all the finest optics and honed skills that are essential for counting as many of the birds that can be counted over a 24 hour period they were eager and ready to go. The weariless weekend watchers counted 6725 individuals of 140 species. While no individual was extraordinarily rare, we did see large numbers of Cedar Waxwings. Cedar Waxwings are considered common but erratic winter residents over most the state (Giff Beaton), and we rarely see more than a couple of them in the Spring Migration Count. This year we counted 157 of these beautiful birds dispersed throughout the island. Do you ever wonder where St. Catherines Island got its name? Recent research on artifacts recovered at Mission Santa Catalina de Guale, located on St. Catherines Island, has provided some insight into this very question. Ironically, the information regarding the name source comes to us from an object recovered on Amelia Island (Florida). There are actually four Santa Catalina de Guale missions in Spanish Florida. The earliest (Santa Catalina de Guale I), built on St. Catherines Island, was attacked in 1680 by British troops and Indian allies, probably in a slave raid. After the attack, the residents relocated to nearby Sapelo Island, establishing the second location of Mission Santa Catalina (II, 1680–1683). The American Museum of Natural History published the newest Anthropological Paper, Seasonality and Human Mobility along the Georgia Bight , on March 6, 2012. The volume, which was edited by Elizabeth J. Reitz, Irvy R. Quitmyer, and David Hurst Thomas, presents new research on methods for reading the seasonality record found in common biological proxies and applying these various methods grounded in the natural sciences to estimate seasonality with particular reference to the archaeology conducted on St. Catherines Island and along the Georgia Bight. In January 2012, St. Catherines Island hosted the 1st Southeastern American Kestrel Working Group meeting, led by Ken Meyer of Avian Conservation and Research Institute (ACRI). This meeting was a culmination of a planning project being facilitated by ACRI with a National Fish and Wildlife Foundation grant to understand the status of and concerns for the SE American Kestrel. Florida, Mississippi, Alabama, and Georgia state and federal personnel attended to report the status of the birds in their area, and to identify needs that each state has to learn more about the status of these Kestrels and understanding their limiting resources. Coming together as a cooperative working group gives biologists and land managers a better understanding of large-scale needs and resources of this species and their habitats. On Friday, December 16th, 42 birders hopped on boats at the mainland eager to get to St. Catherines and check out their assigned areas in preparation for Saturday, the 25th Christmas Bird Count (CBC) on SCI. This is part of The National Audubon Society’s 112th CBC, with the count taking place in over 2,000 locations from December 14th—January 5th. This year was our third best count with 140 species and 33,383 individuals on count day. Four additional species were seen during count week, and the total of 144 matched (with 2002) the highest number during count-week. The field of geoarchaeology has typically been defined as either geology pursued within an archaeological framework or sometime the reverse, as archaeology framed with the help of geological methodology. Either way, the formalized objectives of geoarchaeology define a broad range of pursuits, from placing archaeological sites into relative and absolute temporal context through the application of stratigraphic principles and absolute dating techniques, to understanding the natural processes of site formation, to reconstructing the landscapes that existed around a site or group of sites at the time of occupation. 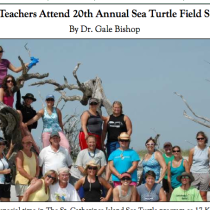 The week of July 16 to 23 was a special time in The St. Catherines Island Sea Turtle program as 17 K-12 Teacher-Interns and 3 Teacher-Mentors participated in the Twentieth Annual Sea Turtle Field School. Each year 16 to 18 K-12 teachers are mentored through sea turtle nest conservation, Island Geology and Evolution. 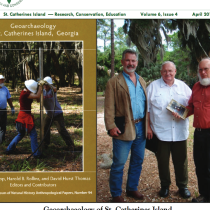 In the Fifth Caldwell Conference, researchers from seven states tackled the issue of microchronology, with particular reference to the archaeology of St. Catherines Island.